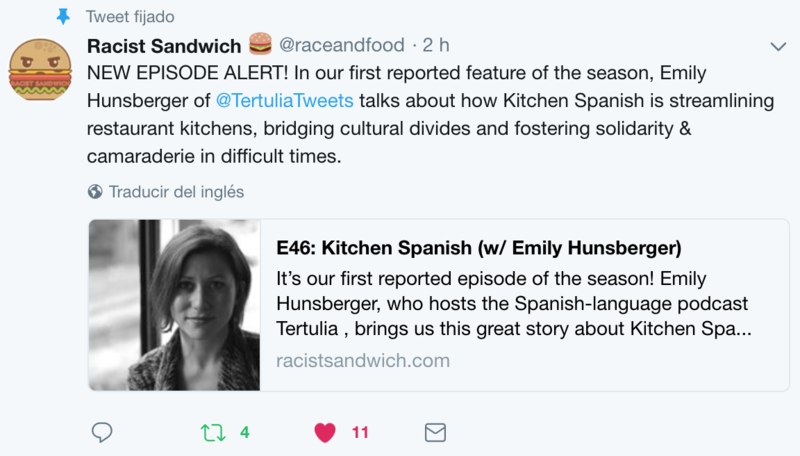 I’m proud to share a podcast segment that I reported for Racist Sandwich. Most of the audio story is in English, and it includes interviews with kitchen staff from restaurants in Grand Rapids, Michigan, including Donkey Taquería and MeXo (which will open in April 2018). Author Emily HunsbergerPosted on 11/April/2018 20/February/2019 Format LinkCategories BlogTags Bilingualism, Bilingüismo, Communication, Comunicación, Donkey Taquería, Español en Estados Unidos, Grand Rapids, Immigration, Kitchen Spanish, MeXo, Migraciones, Racist Sandwich, Spanish in the U.S.